We Know What Keeps IT Managers Up At Night. Bright*Star Remote Application and DBA Services. Like every IT professional who has chosen Oracle technology, you want to optimize system performance, minimize downtime, and meet your budget constraints. Get control with one phone call or email to Database Specialists. Protect your company’s IT infrastructure, and add tremendous value. Let us do the work. Whatever your Oracle database concerns, we will help you rest easy. We have always focused on Oracle technology. Over the years, we have worked to gain a reputation of specializing in Oracle and being among the best in the business. It thrills us that our clients speak highly of us and consistently give us praise, repeat business, and referrals. All of this is because of our team members. We are only as good as our people, and we are confident that you will be as impressed with them as we are. Each member of the Database Specialists team is an Oracle database professional committed to success at every level. Being a member of our team requires outstanding technical skills in Oracle products, excellent communication skills, motivation to learn and the commitment to provide exceptional customer service. Call us today at +91-9823.00.5326 for more information on our remote DBA services. You can also Test out the capabilities of our expert oracle DBAs by requesting a free consultation today. Contact Us at sales@bslion.in now ! When deciding to implement BI Apps for OBIEE it is worth to understand what each packaged analytics contents are and how do they map to the Oracle e-Business Suite modules. I am going to start a series on OBIEE explaining each analytics module and then discuss on the drawbacks of each and how to go about adding customization to the package analytics. But in my experience I have done customizations to the seeded Oracle Apps EUL and gone to the extent of customizing seeded Dashboards in Daily Business Intelligence. There are always rules to be followed and certain precautions to be taken so that your customization do not break any future patching. So there is always a risk. Bright*Star’s Oracle database administrators and subject matter experts have extensive experience with the Oracle Fusion Middleware (OFM) family of products. Bright*Star puts an industry-leading team of Oracle DBAs and Fusion Middleware experts at your fingertips. We’re here for you 24 hours a day, every day of the year, designing, building, testing, and deploying the technical components required for successful Oracle solutions. The combination of a proven delivery model and top-notch experience ensures that we remain your on-demand experts. Create complete set(s) of documentation describing the current configuration of Fusion Middleware. Speak with a Database Expert about your specific Fusion Middleware needs at info@bslion.in or visit our business page at http://www.bslion.in for more information about our services. Bright*Star specializes in implementing end-to-end Enterprise DMS solution. Studies made on document management reveal that its role is constantly growing. The big question is: Where will this lead to? Document management generally starts out as a way of getting rid of preprinted forms, and then evolves into one of the main issues for a company to focus on in order to enhance business productivity and competitiveness. In other words, document management does not only refer to creating and storing documents anymore. It is steadily becoming a key feature in processes that aim to improve business flows. This way of applying document management is not new, but it comes with important innovations and opens up a broad future with a wide range of possibilities, in the short and long term. According to recent studies, document management is playing an increasingly important role in business processes. In fact, according to a recent study by Forbes, nearly two thirds of IT executives are investing in document management initiatives, which clearly demonstrates the wide range of possibilities that document management provides. Computers and devices continue increasing their storage capacities while manufacturers are trying to keep their size within limits. However, as new digital platforms and file types are being launched, document management that goes beyond personal computers and devices has become a key issue for any company, regardless of its size. Studies show that, in 2014, 68% of enterprises are using a growing number of storage devices. This raises two important challenges in document management: quick and efficient content and mobility. Therefore, many document management systems focus on providing a professional search interface that allows users to perform detailed searches and obtain results quickly and efficiently. On the other hand, all signs suggest that, in the near future, document management software companies will focus their strategies on enhancing functionalities related to content management on mobile devices, both for personal as for professional use. We cannot talk about mobility, without mentioning an increasingly popular trend in document management: cloud storage of business documents. Apart from other, obvious, advantages, these new technologies enable employees located anywhere in the world to collaborate and work together on the same documents at the same moment. What, not long ago, seemed impossible, isn’t anymore. After all, defenders of document management software have always promised that one day, the (nearly) paperless office, where electronic documents replace paper documents, would become a reality. An example we all know can be found in delivery services. It seems the only paper they are still using are the stickers they put on envelopes and packages (which, by the way, could easily be replaced by printed barcodes). Clients do not sign delivery notes anymore, but just confirm reception with an unrecognizable signature on a tablet or similar device. Then the delivery is automatically registered at the company´s headquarters and the procedure ends. I have no idea of when printed paper will actually disappear, because it seems that we are wasting much more paper than saving. However, it is clear that, meanwhile, print technologies remain important. Mobile users want to print documents while en route, and, since there are Wi-Fi networks all around us, why not also create printing sites, where documents transferred online are printed? We would only need to go the corresponding location and pick up our printed documents there. Payment would be done automatically and online, of course. Another option for saving and reusing paper consists of assigning expiration dates to printed documents and making the ink on these printed documents disappear after the expiration date. Naturally, legal regulations would oblige the expiration date to be assigned automatically to each page of the printed document. This all may seem very futuristic, but there have been many ideas that seemed unrealistic to many and, nonetheless, have become a tangible reality. OCR (Optical character Recognition) is another technology to be taken into account. There have been important improvements in OCR technologies, including more intelligent interpretation of content and automated document retrieval and classification processes. This is just one out of many document technologies that connect the document management process work flow with other business processes. Then there are also documents that are internally stored in XML format. This type of documents would allow for meta data access and semantically interpreted information, thus facilitating the classification and “electronic” comprehension of the data, while multiplying data search options that are not limited to keywords. Another example of what the future of document management could have in store, is intelligent document management. With this type of software, any changes made on a document automatically launch related processes, triggering a whole new process flow based on the type of change that was applied. Intelligent documents would also be able to automatically search for related links on the Internet or update their content based on parameters. Within the field of document management, this would be a highly automated update technology. Then there is document security. This area cannot be overlooked, as it also needs to be adapted to the new ways in which people and devices interact with information. Electronic documents can already be encrypted, but we could also find a way to carry a confidential document with us in printed format. For example, if the content of the document is compressed and only legible when scanned by a content decryption application. There is no doubt that document management has a bright future, and that it comes with a wide range of possibilities. It seems that most IT executives have already understood its importance, as they are investing in a wide variety of initiatives related to document management. On the other hand, the future of mobility is not clear. For now, it is a growing trend that is rapidly turning into a must-have for most companies. Tablets and smartphones are the future, so companies must implement mobile technologies and strategies to avoid staying behind. The combination and interrelation between the Internet, document management software and other internal business applications is creating very favorable prospects for those, like me, who haven´t even started to scratch the surface of possibilities. This will undoubtedly enhance business processes up to levels that, today, are unimaginable. Generally, we still consider a document as dead paper. Therefore, we sometimes forget that document management software and the documents it generates are the heart, the core, of our business and that its influence and consequences reach every section of our company. Over the past few years, document management technology has evolved at a dizzying pace, and predictions suggest that it will continue to do so in the forthcoming years. Undoubtedly, it will be very interesting to follow up on the future of document management, and how it grows alongside other ever-evolving technologies. One thing is clear: we must let our imagination run free, because many document management technologies that seemed completely impossible just a few years ago, have turned into a reality, or have even gone beyond reality, today. Portlet Producer: Provides a means for developers and administrators to service-enable new and existing ASP.NET 2.0 applications through the Web Services for Remote Portlets (WSRP) standard. Pagelet Producer: The Oracle WebCenter Portal’s Pagelet Producer (previously known as Oracle WebCenter Ensemble) provides a collection of useful tools and features that facilitate dynamic pagelet development. Personalization: Provides the ability to further tailor the usage of the portal and information delivered to the portal based on user’s activities. These features are discussed in more detail as follows…. Oracle WebCenter Portal’s Portlet Producer provides a means for developers and administrators to service-enable new and existing ASP.NET 2.0 applications through the Web Services for Remote Portlets (WSRP) standard. The Portlet Producer also provides an API toolkit that is integrated into Microsoft Visual Studio template extensions to simplify portlet development for .NET developers. In addition, it unlocks the SharePoint Web Parts to standards based portals by exposing these Web Parts directly as WSRP components. Now enterprises can take advantage of departmental resources directly. Oracle WebCenter Portals’s Pagelet Producer facilitates dynamic pagelet development. The producer includes a mashup engine with a light proxy and a security management system that allows users to add portlets as UI widgets or gadgets to any page on any platform. In addition, the producer allows you to integrate external content into any portal and enables mashups from just about any source. Together with Content Presenter and Data Presenter, the Oracle WebCenter Portal’s Pagelet Producer gives business users a wealth of mashup tools to access and present required information without waiting for IT to provide a solution. Users can also publish their mashup components to the Resource Catalog or Business Dictionary for enterprise reuse of these key assemblies. Personalization for WebCenter Portal builds on the foundation that Oracle WebLogic Portal has pioneered and combines capabilities from Oracle WebCenter Interaction (formerly ALUI) to deliver a complete dynamic user experience that can provide targeted branding, processes, and content. In its simplest form, the Personalization for WebCenter Portal can deliver content directly to the users based on existing attributes from many different systems. The published service provider interface enables developers to aggregate any systems to provide a unified user profile to then determine the best set of elements to deliver to the user. Developers build a “scenario” to determine the basic decision logic required, then business users select the appropriate scenario for their audience and the Conductor runs these scenarios when users step through the site. For example, extranet sites might offer customers or partners special offers based on products they’ve ordered in the past. By leveraging the WebCenter Portal’s Activity Graph, recommendations can be delivered directly into the site or called through REST and used wherever they are required. The open architecture for gathering user attributes and exposing the results of the service is essential for delivering a modern user experience for the enterprise or the web. Oracle WebCenter Portal’s Analytics enables users to create usage reports for any custom application or portal. Use Analytics to determine the most important pages of the deployed application or portal, the most used content items, the most active spaces, and the number of users visiting these different sites and services. Analytics additionally provides recommendations to make the Activity Graph service even more valuable. Analytics delivers the type of information business users require to determine how they allocate their resources to enhance and improve the most important areas of the site. And the pre-built WebCenter Portal: Spaces Analytics Dashboard provides space moderators with a tailored view of their overall team interactions and effectiveness. Bright*Star specializes in Oracle Middleware and Oracle webCenter – Consulting, Implementation, Development, Support and Staffing Services….. Feel free to contact us at sales@bslion.in for your needs. Cheers n good day. Ever wondered, how many startups or companies did Google acquire so far and how much did it pay for them? But the main question is, what happened to the acquired companies? Was it all waste of money? With the recent re-structuring, Google became a subsidiary of Alphabet Inc., which now owns most of the parts. Using infocaptor kpi dashboard software, we analyze the list of companies, products and services that Google has acquired since 2001. 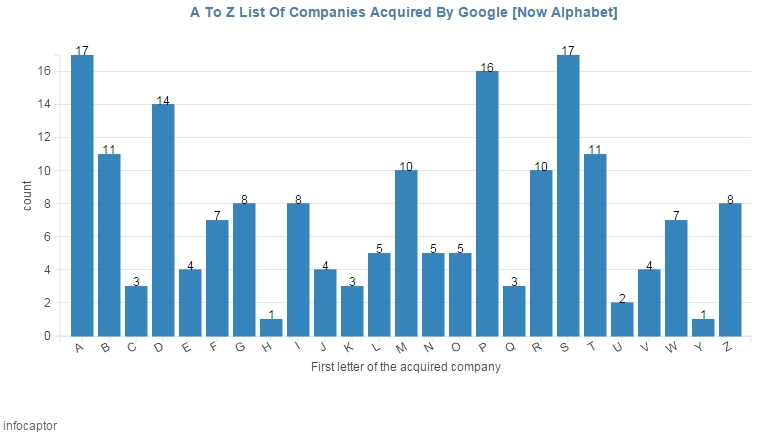 Google has acquired around 184 companies as of October 2015. 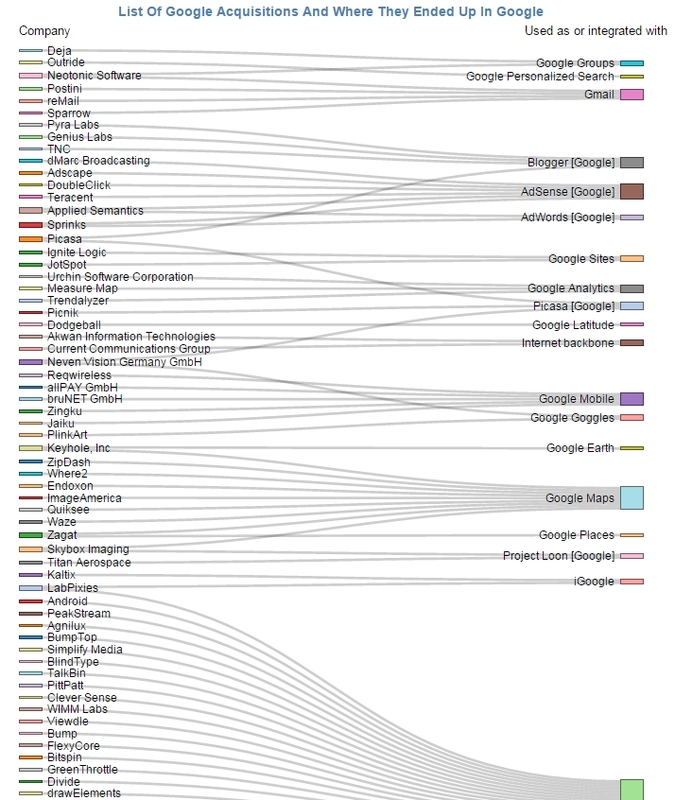 Google has spent atleast 28 billion USD on acquisitions. What Is Oracle WebCenter Portal: Spaces? Empower teams to quickly and efficiently manage their information, applications, projects, and people without requiring IT assistance. Speed delivery of Intranet portal sites and help organizations publish their latest work easily. Bring together the latest technology around social computing, communications, personal productivity, and ad-hoc team interactions. Enable organizations to build Intranet portal sites quickly, and to populate them with information in myriad forms, all without the intervention of either IT or Engineering. Furthermore, WebCenter Portal: Spaces includes powerful, comprehensive administrative tools that allow administrators, web developers, and authorized users to configure spaces to precise specifications. Just some of these features include tailoring the navigation UI, creating a hierarchical site structure that allows administrators to delegate security based on groups, roles, and user identities, creating and customizing pages, and more. Oracle WebCenter Portal: Spaces enables users to work more effectively with project teams and work groups, including teams that span multiple geographies and even include external members. It eliminates or reduces duplication of effort and content inconsistencies, and enables sharing of and collaboration on team content, focusing valuable resources on solving business problems, tapping into new ideas, and reducing time to market. In addition, users can publish and directly edit content in Oracle WebCenter Content. Slow progress on projects and business initiatives due to lack of coordinated information. Information stored on individuals’ desktops and unavailable to others. E-mail overload and proliferation of attachments that can require workflow and verion management. Inaccessible business intelligence information when it is needed most. Direct integration and support of Enterprise application transactions. Client software incompatibility and upgrades (Notes, Outlook, Safari, Internet Explorer, and so on). WebCenter Portal: Spaces delivers a set of powerful features that enable you to provide a productive environment to deliver team-based sites, along with enterprise and departmental portals. These features include the Home Space, personal pages, system pages, business role pages, and Spaces. To learn more about these features, click through the following topics. The Home Space can provide each user with a private work area for containing useful information and, more importantly, for sharing it securely with other users when desired. Depending on your application configuration, the Home Space can be a private dashboard that users can customize to include mail, chat, tracked discussions, documents they have created or shared, and Internet content, such as Google gadgets and RSS feeds. A Home Space represents each user’s personal view, and can include personal pages, business role pages, and spaces.